We’ve seen quite a few superhero costumes here at the Costume City blog, and we’re likely to see more as we get close to Halloween, but there are still some creative people out there who continue to put a new spin on classic costumes like this great Spider-Man costume. Spider-Man has always been a popular hero, and his simple costume has been worn by kids, and adults, all over the world. Different variations, including the Black Suit Spider-Man, have popped up, but I haven’t seen one like this before. I like a few different things about this costume. First off, it doesn’t hide the entire face. While some people might not like this, I’ve always found wearing a mask to be stifling. I’m not sure how Spidey pulls it off, but having cloth over your face really makes it hard to breathe. Another thing that I like is how recognizable this Spider-Man costume is. Anyone who has read a Spider-Man comic, or seen the TV show, will be able to recognize the Spider Sense going off. 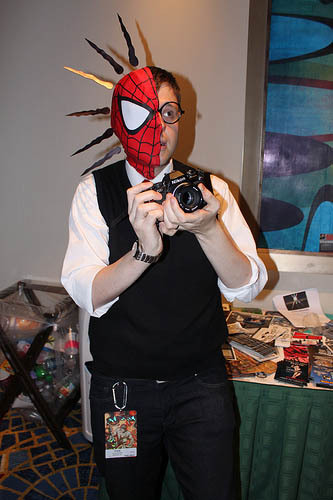 Finally, and this really has nothing to do with the costume, this guy actually looks like Peter Parker. Where was he when Columbia Pictures was casting for the Spider-Man movies? You don’t have to look like the person that you’re trying to imitate to pull of a costume, but it certainly helps. This guy didn’t have to buy a ton of fancy makeup for his costume, and most of the outfit could probably be found at a thrift store. As I’ve said before, the key to a good homemade costume is to pay attention to the defining characteristics. This Spider-Man costume uses the camera, the mask, and the little lightning bolts to define the character. Check out our site for more great Spider-Man costumes to get your Spider Sense tingling. Thanks to Costumepop.com for the picture. You can’t walk past a movie theater without seeing a poster for a new superhero movie, especially after the success of films like Iron Man 2 and Batman: The Dark Knight. Some of the superhero movies slated for release in the next couple of months are looking like they’re going to have some pretty cool costumes, so read on to get a sneak peek at what might be next Halloween’s most popular costumes. There aren’t any action shots from the new Captain America movie available yet, but we do have this nicely drawn up version of the costume. Of course, one problem with comic book movies is that the drawings always look much better before they make the transition to real life. 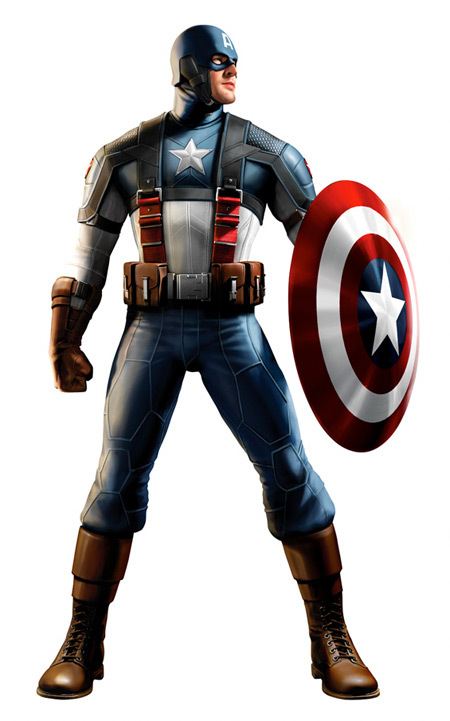 If the Captain America team can duplicate this costume for Chris Evans, the actor playing Cap, then I think it will work. The design isn’t as outlandish as most superhero costumes, and this is certainly something that you could almost see someone wearing, someone who has super strength and endurance that is. 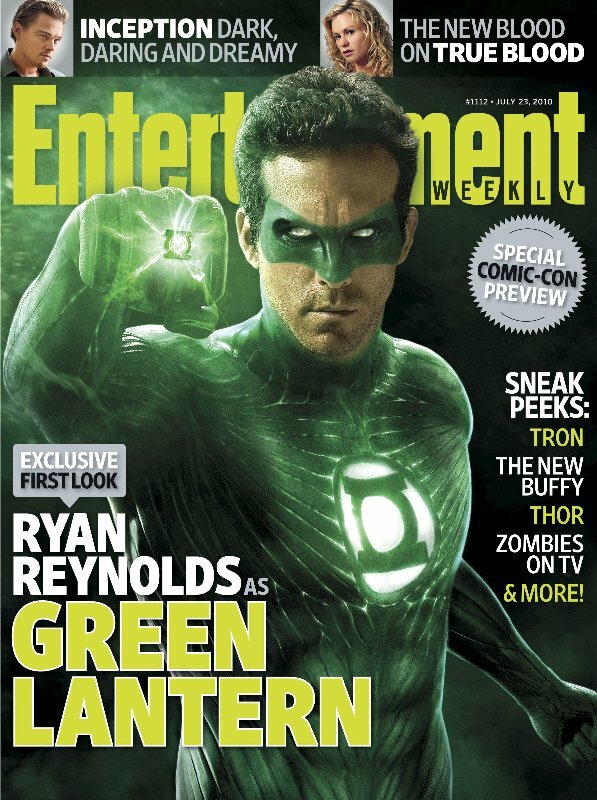 Ryan Reynolds is starring as the Green Lantern in a movie that, up until a few days ago, was being well received by fans. The first images of the costume were just released and some fans started losing faith in the project. The controversy even made the front page of Yahoo news. The costume is a little different than the traditional Green Lantern costume, which is very simple. The new movie costume has added muscular definition and metallic looking lines similar to the Spider-Man movie costumes. You can judge for yourself, but I’m thinking that if this movie does well the costume is going to be very popular. Thor is yet another movie that fans were buzzing about until they saw the movie costumes. Well, they’re still buzzing, but it isn’t as positively. The new costume for the movie are much heavier looking than Thor’s traditional comic book outfit, and fans don’t like how futuristic it looks. 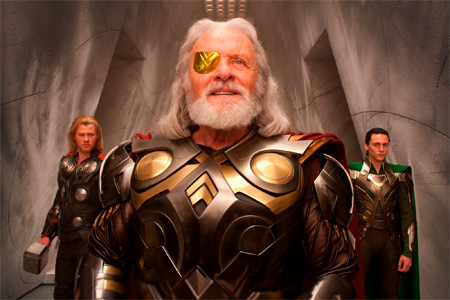 In my opinion the Thor costume looks pretty good, but I don’t know about Odin and Loki’s outfit. I’ve always felt that Norse character should be a little bit more rugged looking, even if they are Gods. Costume City has tons of other superhero costumes, including Batman costumes, Superman costumes and Spider-Man costumes. Check back often for updates on the latest and most popular costumes. Here at CostumeCity.Com we’re starting another new column in addition to our Homemade vs. Store-bought column that we started this week. The new column is called Cool Costume of the Week and it will profile one or two cool costumes that we find during our long hours spent perusing various costume sites online. This week we’re featuring a costume that has gotten quite a bit of praise on the internet already, but I figured it deserved another look. 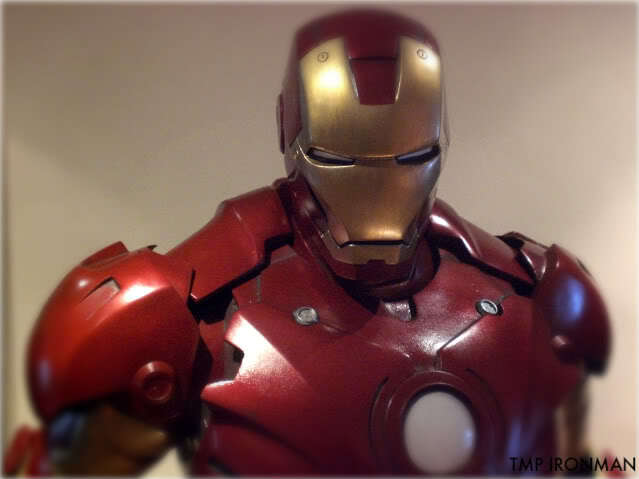 This Iron Man costume was built by TMP and a few other collaborators. In addition to looking awesome, the costume also features a full range of motion. I’m not quite sure how many hours went into making this bad boy, but I’m will to bet that it was more than went into writing this post. I’ve tried to cobble together some information from various forums, and I hope that everything posted here is accurate. According to TMP, “The armor will be mainly constructed from solid glassfiber work with rich details all over. The armor will come finished painted either in the original Mark III colors or custom paint colors.” Kudos to all the guys that worked on this. I’ll let the pictures speak for themselves from here on out. 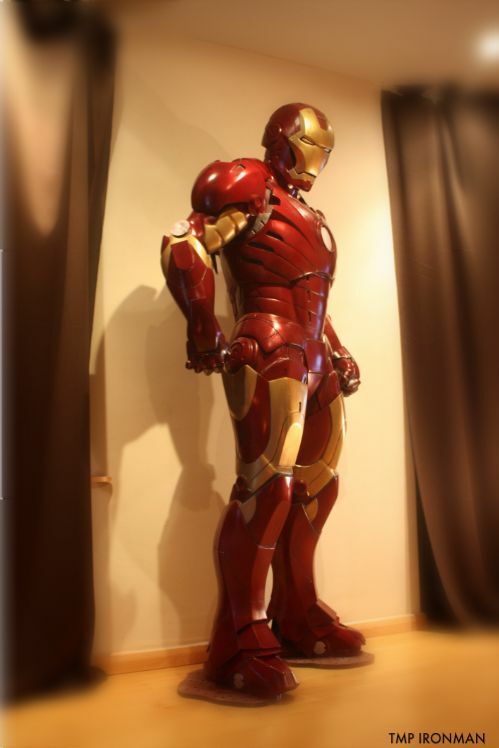 Before you go out and build you own superhero suit, check out the Iron Man costumes at CostumeCity.Com. CostumeCity.Com has a large selection of Iron Man costumes, and we’re going to look at how they stack up with the real thing. This first one is the Adult Iron Man Mark VI Collector’s Edition. 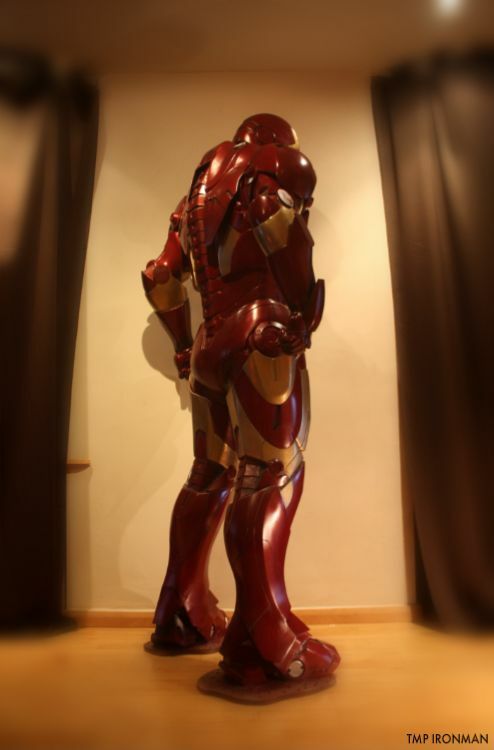 It is a very swanky looking costume and would be great for anyone who really wants to get into the Iron Man spirit. Can you tell which costume is from the movie and which one is the store bought variety? I’ll give you the hint: the one on the left is a lot cheaper than the one on the right. This costume is a kid’s Mark VI model featuring a light up chest. This is a a top-of-the-line kid’s costume and features padded muscles. This is the perfect costume for kid’s to fly around in without bumping and bruising themselves. Finally we have this women’s Iron Man costume. The Ironette Deluxe costume takes the classic Iron Man colors and logos and repackages them in a sassy outfit perfect for any party. We have lots more Iron Man costumes in our store, and we have some great Iron Man Party Supplies perfect for any fan. Post pictures of your own homemade Iron Man costume and we can compare. Check this out to see what you’re up against. Welcome to the first CostumeCity.Com blog post. Today we’re going to be taking a look at the different Iron Man costumes, both on screen and in print. We’ll start with the newest iteration, the costume from the new Iron Man movie. This costume is very similar to the costume from the first Iron Man movie, and if they made any changes it is hard to tell. It’s a pretty swanky look costume with lots of parts sticking out. It definitely isn’t as streamlined as some of the other Iron Man costumes, but it’s no clunker. I would say that this version of the costume is very robotic looking. The joints are accented and this gives a mechanical look to the whole thing. Next we will take a look at the Iron Man armor from the Ultimate line of comics. I like this costume, it has a very futuristic look to it. The other Iron Man costumes carry a heavy resemblence to robots but this one has a more alien or space suit feel. I think that this life-like quality helps to fill out the Iron Man character and bring out the side of Tony Stark that makes him so interesting. This is one of the more current iterations of Iron Man from the comics. It looks similar to the movie version with the highly robotisized accents. This looks too much like some kind of Doomsday robot that someone built. Of course we can’t forget about the original Iron Man. This is one of the oldest versions of the suit, and it looks downright ancient compared to the more updated Iron Man. Oh well, everyone has to start somewhere. 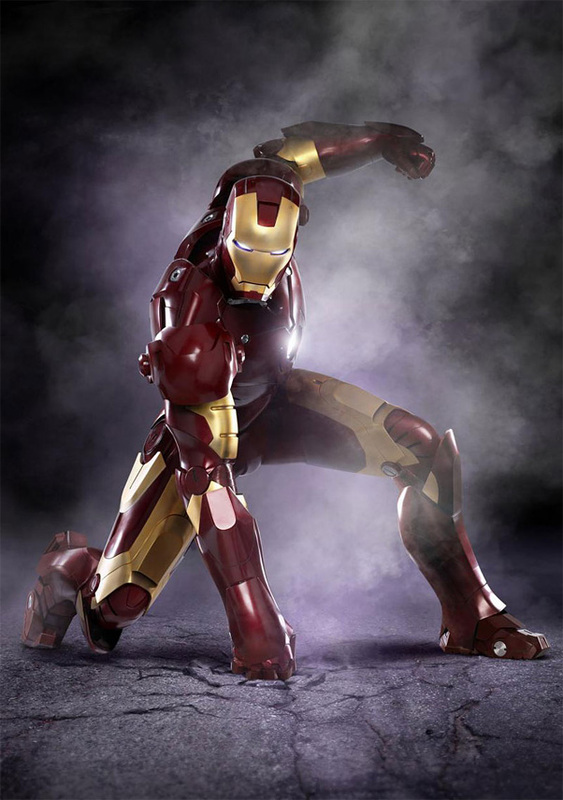 If you’re interested in Iron Man costumes, be sure to check out our complete line of Iron Man costumes at http://store.costumecity.com/ironman.html. Let me know if I missed an important Iron Man costume or leave a comment if you want to vote for your favorite. You are currently browsing the archives for the Superhero Costumes category.